This collection contains my earliest set of images—you might say, a first song, whose lyrics I would nurture for a lifetime. The images (a prelude to future work), inaugurated a spiritual commitment to casting light on humanity’s plight and celebrating its promise. We encounter an autistic boy trapped in silence, a Hare Krishna disciple in a moment of bliss, a runaway teen peering into our eyes, a teacher comforting a despondent child. Each subject, in later years, would be explored on its own—with titles like Inner Grace; The Face of Prayer; Tompkins People; Couples; and The Healing Moment. Within the fifty black-and-white collection, we find a couple embracing at New York City’s very first Gay Pride Parade, the silhouette of an elderly woman facing uncertainty, a homeless man with arms outstretched, like a crucifix, near children at play—images that reach beyond a concern for society’s outcasts, the poor, and the mentally ill, which defined a unique genre of photography infused with my personal theology. This theology points to the generosity of a universe, ready to redeem those willing to be awakened, educate those yearning to be informed, and comfort those thirsting to be consoled. 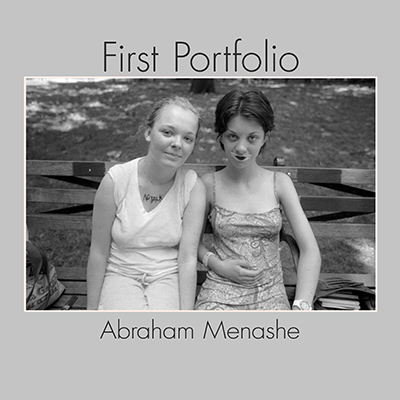 First Portfolio, by Abraham Menashe, available from iTunes.